SJMC 2013: Healthy Lands. Rich Economies. Explore the future of mining in the San Juan Region with leaders from throughout the state. We seek reclamation methods that revive lost history and preserve natural resources. We seek safe, successful ways to reinvigorate the mining industry. To be as inclusive as possible in our discussion, this conference is free and open to the public. Register through sponsor Mountain Studies Institute via the link above. See the agenda below. Click here to view Lynn's presentation via Mountain Studies Institute's YouTube channel. Click here to view Kye's presentation via Mountain Studies Institute's YouTube channel. 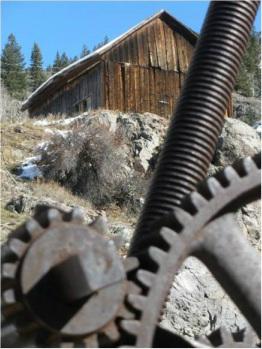 As the first patented mining claim in Hinsdale County – and with an estimated $12 million mined between 1874 and 1903 – the Ute-Ulay mining complex spurred regional development and powered Lake City’s economy for decades. Located three and a half miles from Lake City, this 12-acre site surrounding the Ute-Ulay is formerly known as the town of Henson. This site demonstrates various eras of mining technology – from 1874 up to the 1980s. Structures that remain today include residential cabins, an assayer’s office, the mill, a blacksmith shop, a boarding house, a red-cedar water tank, the main headframe, and several additional historically significant structures. Thanks to a unique partnership of local government, a private mining company, nonprofit organizations, and state and federal agencies, this area is being reclaimed as a heritage tourism destination to showcase mining history and offer outdoor recreational opportunities. LFVC sustains and enhances the rural and environmental character of the Lake Fork of the Gunnison River valley through education, restoration, and stewardship. Hinsdale County serves a population of 843 (2010 census) spread out over 1,123 square miles. Therefore, Hinsdale is the third most remote of the 64 counties of the State of Colorado of the United States. The Town of Lake City is the county seat, and the location of the historic County Courthouse. The courthouse was built in 1877, shortly after the county's establishment in 1874. The UWP is a grassroots coalition of citizens, nonprofits, local and regional governments, and federal and state agencies dedicated to understanding the Uncompahgre Watershed. MSI conducts and facilitates research, provides educational opportunities and internships, and conducts environmental monitoring. We connect scientists and stakeholders across the San Juan Mountain region to go beyond scientific inquiry to the meaningful application of knowledge that makes a difference for the quality of the environment. WHWT is a coalition of community/ watershed improvement groups, confronting the challenges that remain from historic mining in the West. We address environmental degradation and community impoverishment, providing rural mining communities with the skills and capacity they need to make their neighborhoods and watersheds better places to live and work. Starts at $43/night. Bunks and private rooms available. $79/night for a room for one. $89/night for a room for two. $80/night for a room for two.